One of our semi-annual traditions – semi-annual for reasons I can’t comprehend – is taking a trip to Wrightwood, a small town nestled up in our local mountains. Not only is it a quick escape from city life, we love to go up there and enjoy playing around in the snow since that’s what city folk do. Unfortunately, the weather hasn’t been good enough to bring an acceptable amount of snow. There was a storm that moved through the area a few weeks ago that did dump 4-5 inches but we were afraid that by the time we got there it would all be gone. So last Saturday we decided to make a trip up there to see for ourselves. The conditions on a local website stated that there was still some left in the snow play areas. And for the most part, the snow was indeed all gone. It took some driving up Angeles Crest Highway to find some of the more bigger patches of snow and once we found a good pile, we stopped and had some fun. 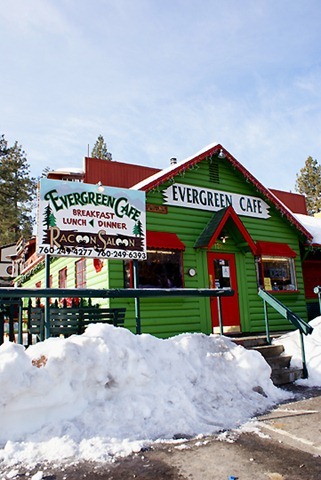 Before we ventured out (or up, for that matter), we stopped for breakfast at the same place we always do: the Evergreen Café and Raccoon Saloon. Still the same: great food at reasonable prices. Note that the picture to the left is from our trip in 2010. For the heck of it, here’s my post from 2008. With that done, we stopped at Mountain Hardware to get some info on where the best snow play areas were. I swear I should have put something down next to this for scale because this print was gigantic. We’re guessing it was a bear. It had to be. The weather was perfect, too. It has to be in the 50s so it wasn’t very cold but it was definitely windy. About the only time I needed my gloves was when we were playing in the snow. Once we were done we headed down to a small shop that Ann loves to peruse — and she never leaves empty-handed. All in all, we a little over 200 miles on the Yaris round-trip and it was a nice way to spend the day with the family. Not too bad for a simple, local getaway. Next trip: who knows? But I’m sure you’ll see pictures from it.